Has God relaxed his standards? “Do not open your mouth in church unless to sing, receive sacrament, and say a respectful Amen.” Those were some of wise words of my grandmother the first time I whispered in church right after she let me know that there was a very hot place that awaited people who disrespected God by talking in church. It stuck in my young mind mainly because her sermon was served together with a very sharp pinch to the thigh and I still find it hard to say anything in church even if we are asked to do so by the reverend. This story came back to me recently when a colleague was narrating an incident in church; during Mass to be specific. The three women behind her decided to use the two hours to catch up on each other’s lives and went as far as posing for a picture. Now that last one I am sure would have had my now deceased grandmother to beseech God to hurry that Judgement Day upon this disrespectful mortals. But alas it is not the worst of ‘crimes,’ for lack of a better word, that people commit in church. At the risk of sounding like those nostalgic people who talk of the good old days, I will compare church etiquette in yester years and how we generally carry on today. Goodbye Sunday bestStarting with the “Sunday best,” which consisted of carefully chosen modest clothes is almost history, with the pretty much anything-goes wardrobe of today. Back then strutting in in noisy kakondos (high heels) late in church could easily have brought the service to a halt, as easily as certain if someone walked in and shouted I am Satan. Tempted to get the juicy details Moving on to talking. Even before the pinch incident, I had never dreamed of actually talking in church. There was a kind of reverential silence the grownups observed, that you would not dare interrupt, which is why I had arrived at the decision to whisper only to realise God also did not like that. Not everyone had a grandmother like mine to guide them, and others simply do not care. A friend confesses: “It is not like lightning will strike you if you as much as squeak.” She adds that she takes situations as is. “A long-lost friend slides into the same pew, do I just keep staring straight ahead? We at least exchange pleasantries in muted whispers of course,” she argues. In your average church service it is clear some people do not see the harm in tittering or murmuring if something necessitates that response. Wait a minute as I check my FB Since phones were on desks and attached to walls, comparing this one will be hard. Fiddling with the phone, scrolling, texting and updating statuses is something only generation iPad are guilty of. Now the excuse is scrolling for the Bible app, or sharing the good news one is hearing to other fellows who did not make it to church on Twitter, but if we were to speak with all honesty, we know at least one person who checks messages, scrolls through missed calls and uses the quiet time to perform such mundane tasks as deleting obsolete messages in the inbox. The list is long including things we do not think twice about like chewing gum, to downright disrespectful like actually picking up a call, never mind that the conversation is hushed. Bottom line: people get away with all this and more in church. Why are church goers likely to do these things? Has God relaxed his standards, or so shallow is our attention span that we cannot pay attention for two or three hours or are we no longer afraid of fire and brimstone? 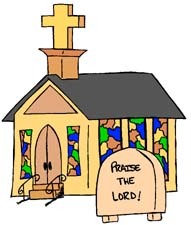 According to Pastor Solomon Male of Arise for Christ, the answer lies in the reasons people go to church today which he lists as: “socialising, to be seen that they have gone to church and because it is something they are used to doing every Sunday.” He continues: “People have stopped relating to God on a personal basis and very few attend church services to understand and commune with God,” he says in explanation. But this still does not explain where all the irreverence stems from. Rev Abraham Kisakye, Chaplain to the Bishop of Namirembe diocese acknowledges that there is a notable laxity in the way people behave in church. “In the past we took learners through the dos and don’ts in church. The training on what was not acceptable started at home and by the time one grew up they were steeped in this moral strictness. The gospel is a contributing factor, rather the bits of it that are championed today. In Kisakye’ s view the whole ‘God looks at the inner man’ teaching while correct promotes a certain school of thinking where people just disregard outward signs of devotion forgetting that the outside also reveals what is going on inside. Male thinks the prosperity gospel has a lot to do with how people take church today. “It is not lost on the congregants that some of their spiritual leaders have lost the sense of purpose,” he says. Apparently, this loss of focus is what presents as people being less and less respectful of worship. So God has not adjusted his standards at all. And yes that means thinking twice about what you will wear, and switching off that phone or at least putting it in silent mode for the duration of the service.